The District Court of Guam was created in 1950 through the Organic Act of Guam. At that time, the Organic Act granted the District Court of Guam original jurisdiction over cases arising under federal law and cases not transferred by the Guam Legislature to local courts, as well as appellate jurisdiction as to be determined by the Guam Legislature. Congress later expanded the court's jurisdiction to include diversity jurisdiction. Shortly after the enactment of the Organic Act, the Guam Legislature created its local court system. It also granted the District Court appellate jurisdiction over certain civil and criminal decisions coming out of the local court. In 1958, Congress approved of such local law by amending the Organic Act to require that appeals to the District Court of Guam be heard by an appellate division consisting of three judges. In 1974, the Guam Legislature created the Superior Court of Guam to replace the existing local court structure. Thus, beginning in 1974, the local courts exercised exclusive original jurisdiction over cases arising under local Guam law (except cases also arising under federal law or related to Guam territorial income tax). As a result, the District Court of Guam was divested of original jurisdiction over cases arising under local law. Finally, upon the establishment of the Supreme Court of Guam in 1994 through the passage of the Frank G. Lujan Memorial Court Reorganization Act, the District Court of Guam was divested of appellate jurisdiction over all local matters. Today, as a result of the above amendments to the Organic Act of Guam, the District Court of Guam exercises exclusive federal jurisdiction. It has the same jurisdiction as that of any Article III district court of the United States, to include federal question and diversity jurisdiction. In addition, the District Court of Guam has the jurisdiction of a United States bankruptcy court and is Guam's tax court. Because of its location and combined nature (district and bankruptcy jurisdiction), the District Court of Guam sees a large variety of cases. For example, in the civil realm, personal injury, contracts, civil rights, prisoner, labor, trademark, habeas corpus, RICO, forfeiture/penalty, and other cases have been filed. In addition, the court's criminal case filings consist of drugs, theft/destruction of property, firearms, white-collar/fraud, immigration and other miscellaneous cases. Finally, our bankruptcy court continues to handle Chapter 7, 11, and 13 filings. Two judicial officers serve the District Court: one Chief District Judge, Hon. Frances Tydingco-Gatewood, and one Magistrate Judge, Hon. Joaquin V.E. Manibusan, Jr.. The court's chambers functions are supported by judicial assistants and law clerks. Administration of the court has been delegated by the Chief Judge to the Clerk of Court, Jeanne G. Quinata, whose staff includes a Chief Deputy Clerk, Charles B. White, and deputy clerks. The Court is also served by the United States Probation/Pre-trial Services Office. The Chief U.S. Probation Officer is Kim R. Walmsley, and her staff includes a Deputy Chief U.S. Probation Officer, Grace D. Flores, a supervising probation officer, probation officers and Information Technology/Administrative Services staff members. The office handles pre-trial and post-sentence supervision of defendants, as well as pre-sentence investigations and reporting. 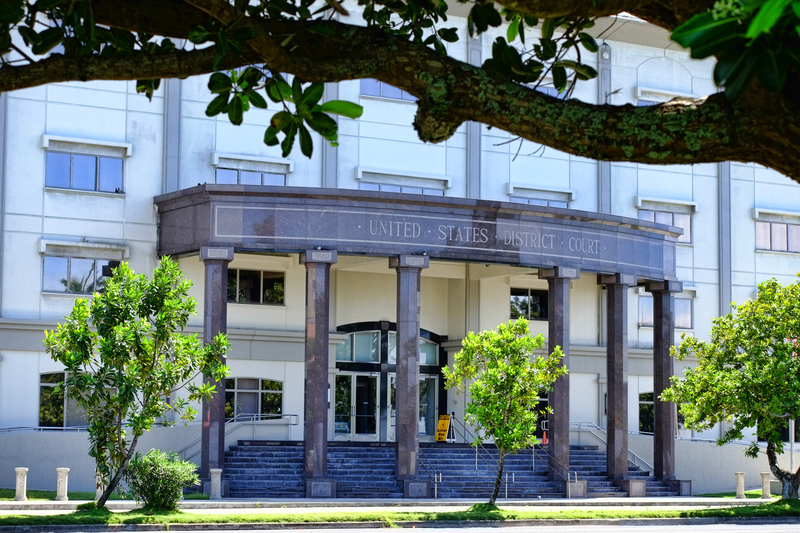 The District Court of Guam sits within the United States Courts for the Ninth Circuit. The largest of all federal circuits, the Ninth Circuit consists of the U.S. Court of Appeals for the Ninth Circuit and the federal and bankruptcy courts in 15 federal judicial districts.